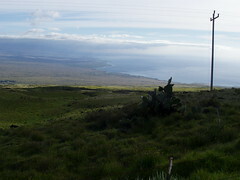 This entry was posted in Strange World and tagged search, taxes, Tweets on January 19, 2009 by Kelson. 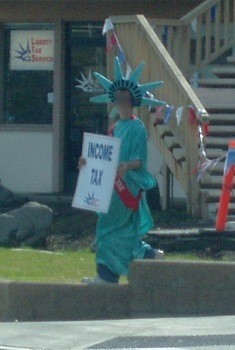 Yesterday, we drove past the same tax accountant who had a Dancing Statue of Liberty out front a few weeks ago. 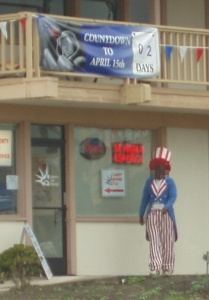 This time, there was a guy outside dressed as Uncle Sam. Also, notice the banner indicating 2 days to April 15. Recall that this was on Saturday… in other words, April 15! Of course, because of the weekend, income tax is due on the 17th this year, so the countdown was correct if you think of it as a countdown to the tax deadline. I figure they just didn’t want to get a different banner just for this year. But it just sounds like celebrating the Fourth of July on July 3. 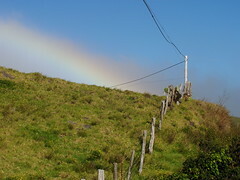 This entry was posted in Signs of the Times and tagged Humor, taxes, usa on April 16, 2006 by Kelson. Add this to the list of jobs I don’t want: Dancing Statue of Liberty mascot. This poor guy—yes, guy—was dancing around in front of a tax preparer’s office last weekend. Faces have been blurred to protect the innocent. This entry was posted in Signs of the Times and tagged liberty, taxes, WTF on March 13, 2006 by Kelson.